A Very Fine Italian 19th Century Carved Carrara Marble Sculpture Group Titled "LA GIOIA NELL'INNOCENZA DOPO IL LAVORO" (The Joy of Innocence After Labour) by Professor Raffaele Belliazzi (Italian, 1835-1917). 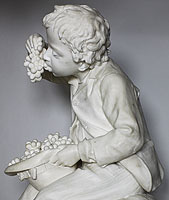 The slender figure of the young boy, seated and resting on a rock with his hanging legs crossed and joyfully eating a cluster of grapes picked from his hat that is resting on his lap. The intricate carving of his shirt, jacket, pants, hat and boots with fine attention details such at the stitching, buttons, the hem on his pants, the wear on the soles of his boots and the features on his face makes this one of Belliazzi's finest known works. The sculpure rests on a dark green serpentine marble pedestal with a rotating top. Signed: Profor. Belliazzi, Carrara. Circa: Florence, 1870-1880. 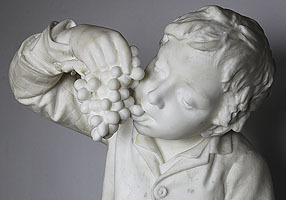 It may be possible to identify the present marble sculpture of a boy eating grapes with Belliazzi's "La Gioia nell'inocenzo dopo il lavoro" of 1874. Like so many examples of Italian verismo sculpture, the titles given to them are deliberately non-descriptive, but rather loosely based on the theme of the subject. Here, the young apprentice is depicted perched on a protruding rock and delights in a refreshing bunch of grapes given to him in reward for his work. The suggestion may be that the exchange of labor for immediate transient pleasures, rather than something more substantial, reveals his very innocence. A Version of La Gioia was purchased by the Royal Household for Capodimonte in the same year, where a gallery of modern art for Napolitan paintings and sculptures had been established. 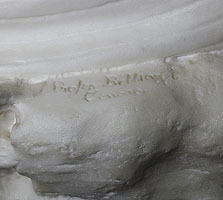 Belliazzi's "Rosina, La Contadinella Abruzzese" had been purchased for this gallery in the preceeding year (1873) and later in 1877 a further marble group of Belliazzi's, the impressive "L'avvivinarsi della Porcella", joined them. This latter sculpture is a masterpiece of verismo, depicting a mother and child battling home against a storm, having collected firewood in the countryside. It was exhibited in Paris, Munich and Naples, where Belliazzi was by now well known. Belliazzi also exhibited works in Milan (1872), Vienna (1873), Antwerp (1894) and London and St. Louis (1904). Royal patronage continued with commission, from King Umberto I in 1888, for a marble statue of Carlo III for one of the niches in the facade of the Palazzo Reale in Naples, where a series of statues of Napolitan Kings were displayed. Vittorio Emmanuele II purchased Belliazzi's "La Primavera" in 1872. Belliazzi was made professor of sculpture at the Instituto di Belle Art in Naples from 1895 to 1912, when he retired. Raffaele Belliazzi was born in Naples in 1835 and was considered one of the preeminent Southern Italian sculptors of verismo. His oeuvre included numerous private and public commissions and he participated in most of the major International Exhibitions of the late nineteenth and early 20th centuries. Here in the present sculpture, Belliazzi renders every detail with excellence. RELATED LITERATURE Panzetta p.25; Vicario p.112; de Micheli pp.283.5; Sapori pp.200, 440.Provenance: Sotheby's London, European Sculpture and Works of Art 900 / 1900 Sale on 5 November 2002, Lot 176. A Very Fine Italian 19th Century Carved Carrara Marble Sculpture Group Titled "LA GIOIA NELL'INNOCENZA DOPO IL LAVORO" (The Joy of Innocence After Labour) by Professor Raffaele Belliazzi (Italian, 1835-1917). 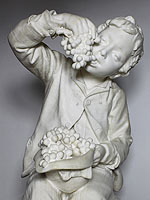 The slender figure of the young boy, seated and resting on a rock with his hanging legs crossed and joyfully eating a cluster of grapes picked from his hat that is resting on his lap. The intricate carving of his shirt, jacket, pants, hat and boots with fine attention details such at the stitching, buttons, the hem on his pants, the wear on the soles of his boots and the features on his face makes this one of Belliazzi's finest known works. The sculpure rests on a dark green serpentine marble pedestal with a rotating top. Signed: Profor. Belliazzi, Carrara. Circa: Florence, 1870-1880. 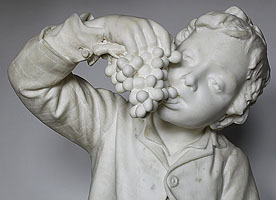 It may be possible to identify the present marble sculpture of a boy eating grapes with Belliazzi's "La Gioia nell'inocenzo dopo il lavoro" of 1874. 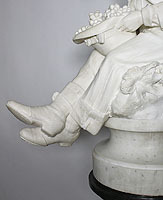 Like so many examples of Italian verismo sculpture, the titles given to them are deliberately non-descriptive, but rather loosely based on the theme of the subject. Here, the young apprentice is depicted perched on a protruding rock and delights in a refreshing bunch of grapes given to him in reward for his work. The suggestion may be that the exchange of labor for immediate transient pleasures, rather than something more substantial, reveals his very innocence. A Version of La Gioia was purchased by the Royal Household for Capodimonte in the same year, where a gallery of modern art for Napolitan paintings and sculptures had been established. Belliazzi's "Rosina, La Contadinella Abruzzese" had been purchased for this gallery in the preceeding year (1873) and later in 1877 a further marble group of Belliazzi's, the impressive "L'avvivinarsi della Porcella", joined them. This latter sculpture is a masterpiece of verismo, depicting a mother and child battling home against a storm, having collected firewood in the countryside. It was exhibited in Paris, Munich and Naples, where Belliazzi was by now well known. Belliazzi also exhibited works in Milan (1872), Vienna (1873), Antwerp (1894) and London and St. Louis (1904). Royal patronage continued with commission, from King Umberto I in 1888, for a marble statue of Carlo III for one of the niches in the facade of the Palazzo Reale in Naples, where a series of statues of Napolitan Kings were displayed. Vittorio Emmanuele II purchased Belliazzi's "La Primavera" in 1872. Belliazzi was made professor of sculpture at the Instituto di Belle Art in Naples from 1895 to 1912, when he retired. Raffaele Belliazzi was born in Naples in 1835 and was considered one of the preeminent Southern Italian sculptors of verismo. His oeuvre included numerous private and public commissions and he participated in most of the major International Exhibitions of the late nineteenth and early 20th centuries. Here in the present sculpture, Belliazzi renders every detail with excellence. Sotheby's London, European Sculpture and Works of Art 900 / 1900 Sale on 5 November 2002, Lot 176.